Fusing OLED technology with 4K resolution, LG OLED 4K TV brings you the finest viewing experience imaginable. 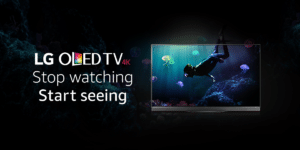 With self-lighting pixels – meaning they switch on and off individually – OLED delivers the purest blacks, most brilliant colours and clearest images. Add to that a unique four colour pixel and you will see that LG OLED 4K TV is The Ultimate Display. Thanks to the self-lighting pixels, which are unique to LG OLED 4K TV, you get infinite contrast, delivering the deepest and darks blacks possible today. Lights out. Thanks to an intuitive design which creates a floating screen effect, you can now enjoy a whole new level of immersion and style. Thanks to self-lighting pixels, LG’s OLED TV achieves perfect contrast through its ability to switch off individual pixels, resulting in deeper blacks and brighter whites. With a response speed of over one thousand times faster than conventional LED TV, OLED allows you to appreciate fast moving scenes like sports or action movies free from blur. This OLED 4K TV screen has a subtle curve, giving it a striking look and providing a more cinematic viewing experience. LG’s unique Magic Remote enables simple TV navigation, using point, scroll, gesture or voice commands – the most convenient and advanced TV remote.SMARTSHARE™:Browse and share files from external devices wirelessly on your large TV screen or watch TV on another smart device with LG Smart TV’s SmartShare™. 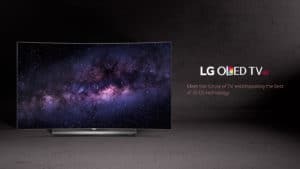 LG introduces a true Smart TV that connects to other devices more easily than ever. Enjoy any content without constraint. 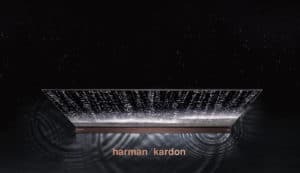 A highly refined speaker system engineered by harman / kardon will give your ears a premium audio experience. So now you can fill your room with the ultimate sound, to match the ultimate picture. The 4K Upscaler converts lower resolution entertainment to near 4K quality using a unique 6-step image processing technology. So whether it’s broadcasts, movies, sports or more, you can now enjoy it in incredible detail.